You might not expect waiters to oppose Maine's recently approved minimum wage increase, but they do - at least in part. They support keeping the minimum wage for tipped workers as is out of fears they’ll lose income and jobs. Restaurant servers know that good service leads to good tips and they’ve always been willing to take a low base hourly wage knowing that they can earn ten times more through tips. However that will soon be over when Maine’s new minimum wage kicks in next January, and the servers are angry. More than half of Maine residents (55 percent) approved a ballot initiative raising the state’s minimum wage from $7.50 an hour to $12 by 2020. It also raised the wage for service workers who earn tips from $3.75 to $5 an hour by 2017 and $12 by 2024. It’s common for minimum wages for tipped workers to be decoupled from the general minimum wage, because tips can quickly boost overall earnings far above. 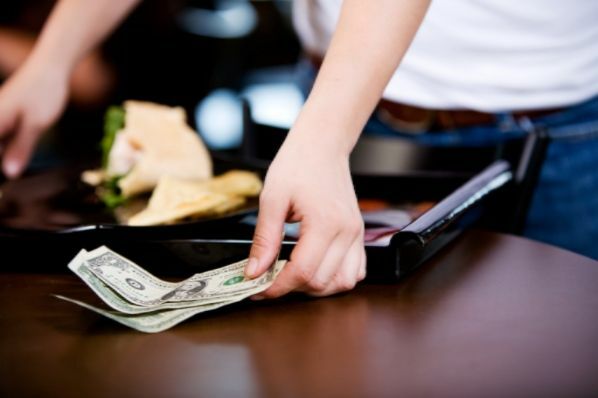 Under Maine's current system, restaurants owners get a tip credit from the state that allows them to pay tipped staff half of the prevailing minimum wage. It’s worked so far allowing tipped workers to pull in $25-$30 an hour at one restaurant. It also incentive's good service among staff. Maine’s tipped service workers aren’t cheering the new higher base pay though because they know that their employers will struggle to pay it and cut staff or raise prices on the menu. Raising prices is even a tricky solution. Customers may be unwilling to pay the higher prices and stop patronizing establishments or they may cut down on the tips to servers because the overall cost of a meal is so steep. [Erica] Jackson, a Scarborough resident who has worked in the restaurant industry for 11 years, said she personally supports raising the minimum wage, but like many people working in the hospitality industry, is worried that it will lead to layoffs if owners are forced to raise menu prices. The workers also plan to push the legislature to amend to the new minimum wage law. However, because the minimum wage increase was done via ballot initiative, it’s questionable whether the appetite among lawmakers will be strong enough to swallow legislative action. “Right now I feel like it fine the way it is. Basically we make our money through tips,” Grey added. “It is at a reasonable rate where we can survive, go to school, save our money or do the things we want to do. If [Question 4] does pass, by the time we will be earning $12 an hour, we won’t be making enough money” because customers won’t be tipping as much. Raising the minimum wage in theory seems egalitarian and helpful to workers struggling under higher prices at the pump and grocery store or higher rent. However, someone must pay for it. If you pass that cost along to customers they may split leaving employers with little to pay workers or to keep their doors open. Sometimes the impact is swift such as the Washington parents paying a third more for childcare. Sometimes it’s a slow erosion of jobs, but the unintended consequences are real and expected. As several cities and states passed higher minimum wages on their ballots, we can expect to see more of this hardship on the very workers it’s supposed to help.